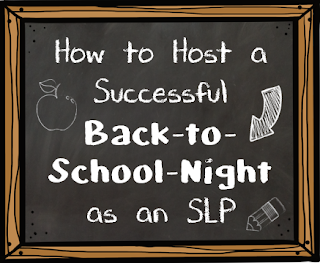 As an SLP, I feel like I only get to connect with most parents at their child's IEP once a year, so I make an effort to meet with parents during every opportunity I get. That's why I love Back to School Night ("B2SN")! I am fortunate enough to have a large enough room where I can accommodate more than one parent at a time. Are you feeling discouraged from participating in B2SN because you think your room is too small? 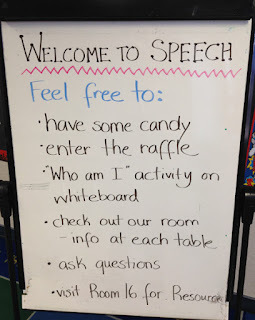 Even if your Speech room is in a modified broom closet it can be done -- maybe tables could be set up outside your room where you can do a lot of the activities described below. B2SN is a great and valuable opportunity to let parents know you are there. Of course as an SLP, presentations are slightly different than those of a classroom teacher. Here are some helpful suggestions to ensure your B2SN is a success! 1. Make sure parents know about it - Send out an e-mail blast to all your speech parents announcing that you will be present during B2SN. Let them know where your room is and what times you will be there. A day before the event, send out a reminder e-mail. 2. 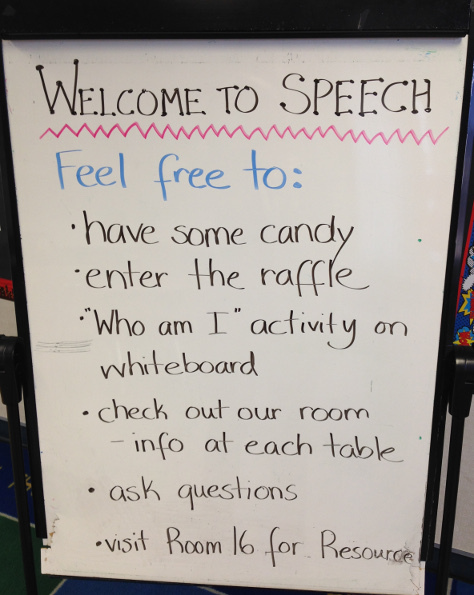 At the entrance to your room, post a whiteboard or sign with some general instructions. That way, if parents arrive while you are engaged with another parent, they can figure out what to do with themselves while they wait. 3. Have fun activities! For my activity, I chose to do another "Who Am I?" activity. Remember this from two years ago? 4. Showcase your room! 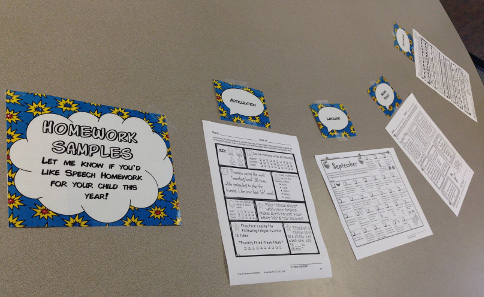 I created several "Stations" for parents to look at. 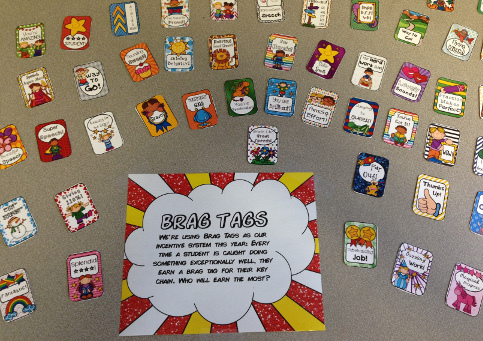 I had a "Homework" station where parents could look at the different types of speech homework available; a "Social Skills" station, where parents could browse through my social skills curriculum; and a "Brag Tag" station that explained all about the brag tag system we are using this year. 5. Have some candy available. Everyone loves free candy! 6. Have a raffle. Even though the grand prize was only a $5 Jamba Juice gift card, I probably made one of my students' days. 7. I didn't do this due to lack of time, but it would be great to showcase something made by students. This could be something like "All About Me" posters hung up around your room, students drawing a picture of themselves doing Speech, students completing a sentence frame (e.g., "My favorite part of Speech is..."), etc. 8. This goes without saying -- make sure your room is tidy. Get rid of clutter and move confidential paperwork out of sight. 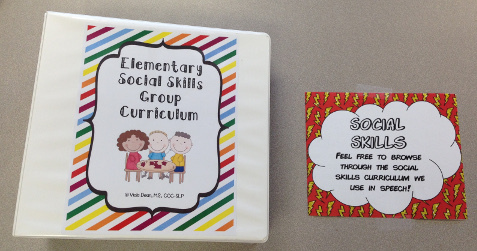 B2SN is such a wonderful opportunity to connect with parents outside of IEPs. I'll be back again next year!